I receive frequent inquiries from folks asking about purchasing my art or otherwise supporting my photography. While I welcome all inquiries about purchasing original prints, I am something of a purist, in that I don’t create multiple versions or “limited series” of the same print. Almost all of my images are therefore one-of-a-kind (with some occasional exceptions for separate, one-of-a-kind prints that are toned or have alternative processes applied using the same negative as a B&W print). For this reason, purchasing my art is sometimes cost-prohibitive for some people. While there are some coffee table books in the works, as well as the possibility of a line of cards with my images being available sometime soon, there have not been, until now, any “in between” ways to support my art; it’s either been buy an original print or show up at an exhibition (or on my site), say nice things, and encourage me to keep going. While I appreciate support of ANY kind–even the generous but free variety–I realize that many of you want to do more without breaking the bank. Some of you, for example, just enjoy seeing my work posted here or hanging in an exhibition, without having the need to possess it, but you want to do something to help. Whatever your reasons, if you like what I do and feel a need to help me defray the cost of doing it, then I welcome any donation of any amount that you might want to give. Maybe you want to contribute toward reducing the overwhelming cost of exhibiting my work. Maybe you want to help fund my excursions to odd and interesting places. Or maybe you’re intrigued by my efforts to preserve and re-present found film and old negatives. In any case, if you choose to make a donation–no matter how big or small–I will gladly do the one thing I can proudly do both here on the website and at my shows: I will thank you by name for helping make my art possible (unless, of course, you wish to remain anonymous). To help out, just click on the “Donate” button below, which will take you to PayPal to complete your donation. 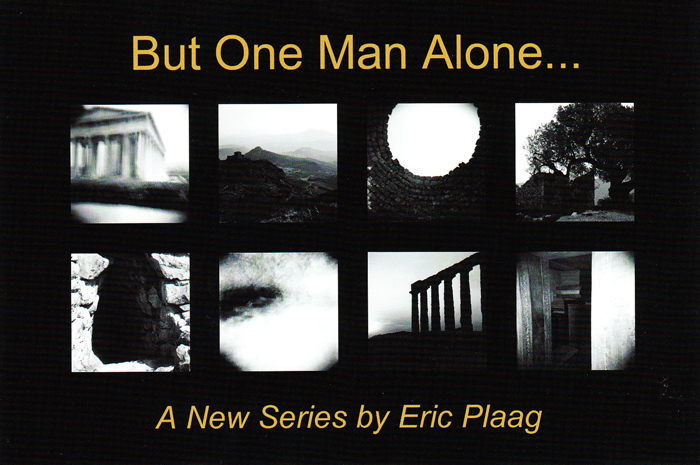 And while supplies last, for a donation of $5.00 or more, I’ll send you your very own “But One Man Alone…” limited edition postcard, signed by me. Just make sure to include your mailing address in the text box with your donation. If it won’t fit, email me at eplaag @ hotmail.com (no spaces) with your address and the amount, date, and time of your donation. Thanks for visiting, and thank you for your support!